Johannesburg Sep 14 (IANS) Cricket South Africa on Friday recalled veteran fast bowler Dale Steyn and leg-spinner Imran Tahir to the 16-man squad for the upcoming three-match One-day International (ODI) series against Zimbabwe starting September 30. Steyn who last played an ODI in 2016 will return to the 50-over format following a lengthy injury-enforced break. The squad also included uncapped Christiaan Jonker as the lone fresh face. Jonker had scored an impressive 49 in his lone Twenty20 International match against India. 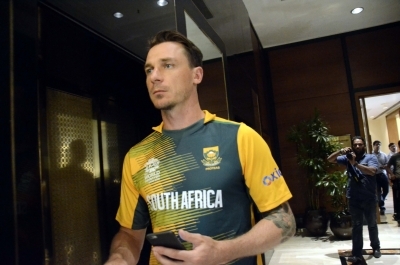 Steyn has declared his intention to be in South Africa s scheme of things for the ICC Cricket World Cup 2019 and this series will give him a good chance to prove his worth. Tahir who was rested from South Africa s tour of Sri Lanka makes a return following steady performances in the Caribbean Premier League (CPL) 2018. Batsman Khaya Zondo has been included while Quinton de Kock and David Miller have been rested with South Africa keen to try a variety of options ahead of the World Cup next year. Faf du Plessis who sustained a shoulder niggle during the recent tour of Sri Lanka is named in the squad but his participation is not entirely guaranteed as the captain is still in recovery an International Cricket Council (ICC) statement said. For the three T20Is there are two new faces in Rassie van der Dussen and Gihahn Cloete both batsmen while quickie Kagiso Rabada has been rested. ODIs: Faf du Plessis (c) Hashim Amla JP Duminy Reeza Hendricks Imran Tahir Christiaan Jonker Heinrich Klaasen Keshav Maharaj Aiden Markram Wiaan Mulder Lungisani Ngidi Andile Phehlukwayo Kagiso Rabada Tabraiz Shamsi Dale Steyn Khaya Zondo. T20Is: Faf du Plessis (c) Gihahn Cloete Junior Dala Quinton de Kock JP Duminy Robbie Frylinck Imraan Tahir Christiaan Jonker Heinrich Klaasen David Miller Lungisani Ngidi Dane Paterson Andile Phehlukwayo Tabraiz Shamsi Rassie van der Dussen.